He mentioned a road up to Col de la Frasse that I had never heard of - so i got the maps out and made a plan. 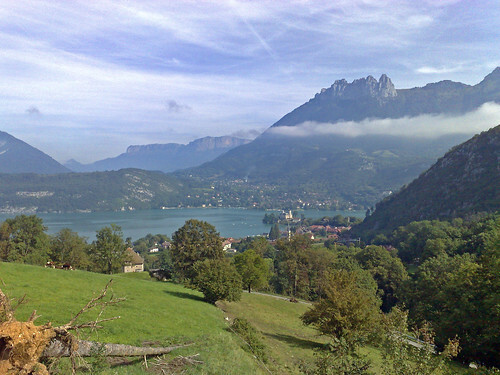 I received a nice comment from Colin recently on my Top 5 Cycling Climbs from Lake Annecy post. I started near Annecy – with 10 kms alongside the lake on the cycle path. A few hundred metres before the cycle-path tunnel and before Duingt there is a little right turn. The climb starts here (see map below). It’s a charming climb – fairly steep through woods and pasture. The climb lasts 10 kms on a good surface – a great little climb for a road bike – requiring a U-turn back down as the paved road ends at about 1150 metres. But for me the adventure began here. not ride-able. So I just pushed my hybrid and hiked along a VERY muddy/steep trail for the last 1.5 kms to the Col.
My plan was to go over the top and down the other side. So another 2 kms of steep descending/hiking with cow bells ringing everywhere until I ended up in Mont Derrière or in English: Bum Mountain (ok, a rather loose translation). I was now in the Bauges Alps. Sparsely populated, green, rolling roads. Really nice cycling. I took a quick detour left on a deserted dead-end road to climb Col du Plane. I met a road cyclist – and sensed he was a bit disappointed when the paved road ended – I rode the last 2 kms on ride-able gravel trails to the Col without him . 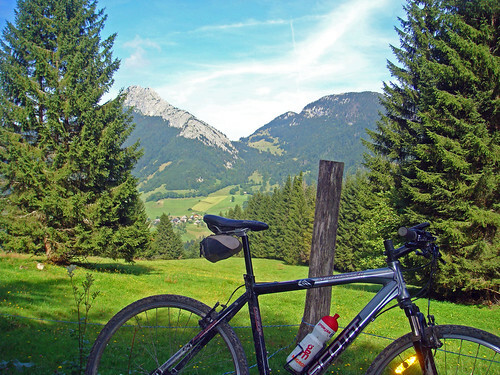 At the Col, a u-turn and a fast return to Annecy via Col de Leschaux with views of the Lake. Thanks Colin for the suggestion! Clouds are really cool in the pics – looks like it was a beautiful ride! Rode up this today, hotel is at the base of the Entrevernes hill. Part of my training week is 3 -5 climbs up the the top of the Village where the road then climbs to La Frasse. Today i rode it and was also gutted the road ended. You are right, its a pleasant climb but saw a few mtbers at the top.